INSIDE GREETING: A big Happy Birthday! And a wish for the best, Through a year that will always, Stand out from the rest. We plucked these images from our rich collection of greeting cards; most are from the 1950's. While this era's design sensibilities are not often celebrated, this offering of stuffed animals, adorable puppies, smiling elephants and more has a naive charm that is very appealing. The die cutting emphasizes the cards' blunt graphic appeal. The colors are vivid, and the appropriately lighthearted greetings are suitable for general birthday use. While certainly suitable for giving to a child, we think these cards will also appeal to many adults for nostalgic reasons, evoking memories of birthdays past, of cakes decorated with cowboys or ballerinas, of games of musical chairs or the thrill of a visiting clown or magician. 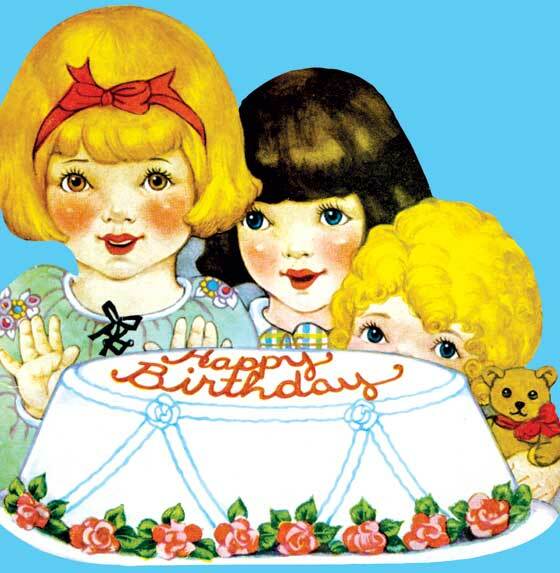 Here some happy, smiling children anticipate a delicious looking birthday cake.